This edited article about the Thirties originally appeared in Look and Learn issue number 680 published on 25 January 1975. However low his state has become, man never loses sight of his pride. He can be poor, hungry, cold and down-and-out but always, somewhere deep within him, there still lurks a streak of pride. It is the same with nations, which, after all, are only human. In the nineteen-thirties the nations of Europe were poor and down-and-out, but somehow they still had to show their pride. And the principal stage upon which they exhibited it was the North Atlantic Ocean. Here, for the thrilling, unbelievable five day trip to all the wonders of the New World, sailed the incredible luxury liners of the great European nations vying with each other to demonstrate greater and greater luxury, more and more comfort, undreamed-of splendour, all of which was in curious contrast to the lives of most of the people who lived under their flags. In October 1932, Normandie slid down the slipway to make France the owner of the greatest liner in the world. She was about 1,000 ft. long and had a gross tonnage of 80,000 tons. She had the first theatre ever to be built into a liner and a 100 seat chapel. There were 350′ square yards of gardens laid out on her decks and a garage for 100 cars. She had dog kennels with “dog promenades” and special enclosures for birds and butterflies. She cost £20 million to build and even before she was launched, it was officially admitted in France that under no circumstances could the Normandie be expected to pay her way. There was nothing in the world afloat as brilliant as the Normandie – until Britain launched the Queen Mary in 1934 and sent her on her maiden voyage in 1936. This edited article about Joshua Slocum originally appeared in Look and Learn issue number 680 published on 25 January 1975. The sailing sloop Spray was only 36 feet long, and the weather off the coast of Patagonia could hardly have been worse. Under short sail the little vessel rode it out as best she could, rising to the crest of each tremendous wave before dropping like a stone into the trough, while her timbers groaned in protest. Suddenly the Spray’s captain glanced behind him to see a wave of unbelievable size bearing down on him. He knew instinctively that there would be no riding this one. 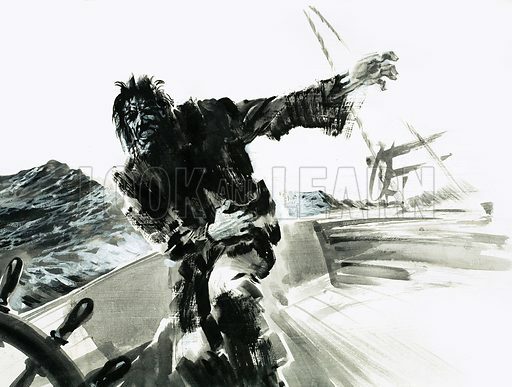 Without a moment’s hesitation he abandoned the wheel and leaped for the rigging, scrambling up as high as he could go. From the top of the mast the man looked down in time to see the whole of his vessel vanish beneath countless tons of water. Clinging desperately to the rigging, he waited to see if the deck would appear again or not. Somewhat to his surprise it did, water cascading from it as the sloop shook herself like a dog. Totally unperturbed, the captain slid down from his perch and regained the cockpit. Perhaps if he had had some companion he might have made some half joking remark. But there was none. In that January of 1896, Captain Joshua Slocum was engaged on an enterprise that had never been attempted before. Single handed, he was sailing round the world. This edited article about the Western originally appeared in Look and Learn issue number 680 published on 25 January 1975. The hot, dusty street is deserted, the stillness broken only by the creak of a rusty saloon sign, gently swinging. A lone cowboy, hand poised over gun-holster, walks slowly into view. From the shadows emerges a dark, menacing figure. The classic Western confrontation scene, the showdown, is about to be played – a scene so familiar that it has often been parodied, yet it remains part of an action pattern, a ritual which seldom fails to grip an audience. The story of the Western is nearly as old as the Cinema itself. This edited article about Pablo Picasso originally appeared in Look and Learn issue number 680 published on 25 January 1975. The most influential and best known artist of this century, Pablo Picasso was born at Malaga in Spain on October 25, 1881. His father, Jose Ruiz Blasco, was a teacher at the local school of Arts and Crafts. Picasso attended art schools in Barcelona and Madrid and early on showed remarkable talents in the field of art. In 1903 the artist settled in Paris and from that time, spent most of his life in France. At first, he painted realistic pictures of ordinary people. He was fascinated by the life of the circus and the big city, although he painted not the gaiety of these subjects but their sadnesses. This period of his life has been called his ‘blue period’ because he painted entirely in different shades of blue. But it was not long before he was experimenting with different methods of painting in particular the cubism method. In cubism the artist does not try to paint recognisable pictures of actual objects, but to make pictures out of shapes such as cubes and triangles. Later, sometime after 1918, Picasso’s paintings became more realistic again, but in 1924 there came another change in his work. Instead of using shapes and colours to give pleasure to people, he began to use them to disturb people. Distressed by the state of the world, he began to paint pictures which reflected the evil shown by mankind. Picasso’s most impassioned protest against a human act of aggression was revealed in his picture ‘Guernica’, a terrifying painting in which is seen all the artist’s horror at the bombing of the defenceless town of Guernica during the Civil War in Spain. This painting is a surrealist distortion of reality. He could have quite easily painted this picture in grotesque realistic detail in the manner of a photograph, but he chose to express his horror at such senseless inhumanity in his own individual, highly effective style. And this brings us to the shocking aspect of Picasso’s style. By distorting reality, he shocked many people with his paintings and drawings which may sometimes seem as if they have been executed by a careless child. But Picasso was a superb artist, and could easily have painted his pictures in a realistic style. He decided to distort natural everyday things in order to make them more ‘real’ to the observer. Few people today would dispute that Picasso has radically altered the course of art. His originality and imagination was to this century what Michelangelo’s was to his. Picasso has influenced every artist who has come after him, and today, nearly two years after his death at 91 on April 8th, 1973, his work continues to stand out among that of all others in the twentieth century. 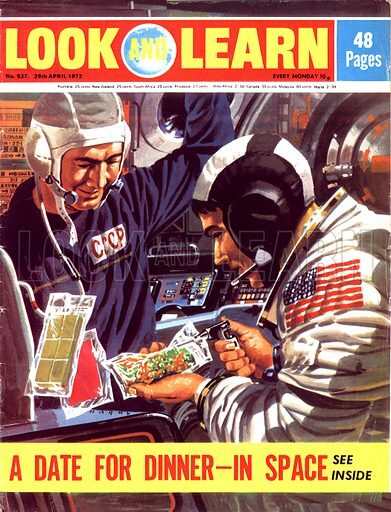 This edited article about space originally appeared in Look and Learn issue number 680 published on 25 January 1975. American and Russian spacemen will shake hands in an orbiting sky station 130 miles above the earth this summer at the start of the most significant space flight so far. This daring, joint enterprise stamps one of the seals on US-Russia friendship and may well open a chapter of co-operation between the two super powers for exploring not only our own solar system but also the inky vastnesses leading to the stars themselves. The teams most likely to make the historic flight have been earmarked, although official confirmation has yet to come from the Russian and American space authorities. Target date for blast-off for both crews is July 15. From the Russian space centre at Tyuratain near Baikonur in Central Asia, Colonel Alexei Leonov, the first man to “walk” in space in 1965 and one of Russia’s most experienced cosmonauts, and his colleague Valery Kubasov will take off in a Soyuz spaceship. Seven hours later from Cape Canaveral, Brigadier General Tom Stafford, commander of the US crew, Major Donald Kent Slayton and Vance Brand will be shot into the skies over the Atlantic in an Apollo craft carrying special docking equipment to rendezvous and link up with the orbiting Russians. As they close together, the jointly-designed docking module atop the Apollo spaceship will be aimed by pilot Brand through a sighting device at a six-inch target zone on the Soyuz craft. Once locked together, both teams will be able to visit each other through the docking module itself. 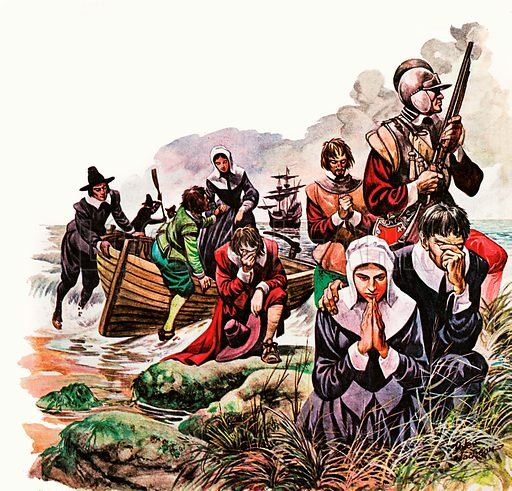 This edited article about the Pilgrim Fathers originally appeared in Look and Learn issue number 680 published on 25 January 1975. There were tears in the eyes of most of the people gathered on the deck, watching the coast of an England they would never see again slowly recede into the mists. Above them, the sails billowed under a brisk breeze as the captain set the ship’s course westward for a 3,000 mile journey across the Atlantic, which was to take its passengers to a new and unknown world. The ship that had sailed out of Plymouth on that day in 1620, was The Mayflower, and it carried on board a party of colonisers who were to become known as The Pilgrim Fathers. They had left England because they were Puritans, who had suffered from the religious intolerance of those times, and North America seemed to them the ideal place to make a new life for themselves. This edited article about Derbyshire originally appeared in Look and Learn issue number 680 published on 25 January 1975. A dark, unknown world, where rivers rush down narrow black passages, pouring into huge, inky underground lakes with a thunderous roar . . .
What place can this be? Africa? South America? The answer is neither. For this intriguing world is in Britain – under the limestone hills of Derbyshire. Every summer skilled parties of young people challenge the mysterious world of caves and pot-holes under Derbyshire’s hills. They are called pot-holers, and since pot-holing is a hazardous business, you may read about them from time to time. Exploring the caves can be exciting and fun – but it can also be dangerous. If an accident happens below ground, rescue squads rush to the area. Police with portable radios and mountain ambulance units stand by as members of Cave Rescue teams crawl through twisting passages and up vertical gullies. It may take more than a day before the injured man, lashed on a stretcher, can be taken to hospital. 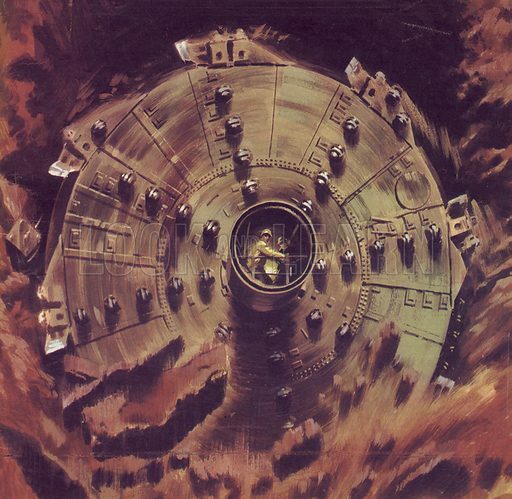 But how does this underground world happen to be in Derbyshire? The answer lies in the rock which forms many of the hills there. The rock is limestone, which is dissolved by rain which has picked up acid from the air and the ground. 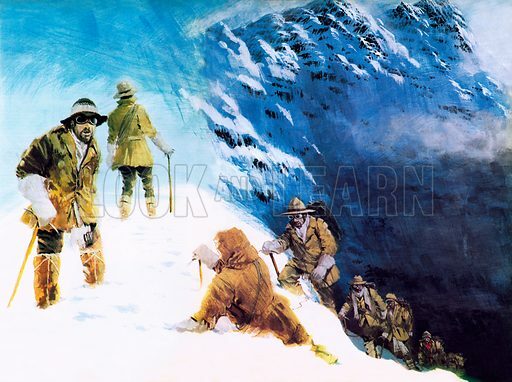 This edited article about George Mallory originally appeared in Look and Learn issue number 680 published on 25 January 1975. Tea time in Victorian households was supposed to be an opportunity for quiet conversation, which was why the Rev Herbert Leigh Mallory looked up disapprovingly at the sound of shouts of alarm beyond the vicarage garden. Hurrying outside, he found a group of worried neighbours staring up at the roof of Mobberley Church, where a small figure, very correctly dressed, had just completed his climb of the church tower and was now edging his way very competently along the line of the roof. Tiny though the figure seemed from the ground, no-one had any difficulty in recognizing the Vicar’s son, seven-year old Master George, who half an hour earlier had been banished to his room for making too much noise. The Vicar waited until his son had safely regained the ground then faced him angrily. But he had gone to his room, young George protested. He’d gone there to collect his cap before he set off on his climb. Nobody had said anything about staying there! Somewhat baffled, the climber’s parents gave up. But one thing was certain, the sooner George was sent off to school the better, otherwise he would certainly break his neck. The older Mallorys’ concern for their son was understandable, because he was unlike their other three children. True, he was intelligent, well mannered and exceptionally good looking, but this was balanced by a strange, almost compulsive need to climb things. Buildings, walls, trees, the object was unimportant so long as it was as high and as dangerous as possible. This edited article about the British army originally appeared in Look and Learn issue number 680 published on 25 January 1975. “There’s a likely looking lad,” shouted the leader of the press gang as he bounded down the street in pursuit of the fleeing boy. 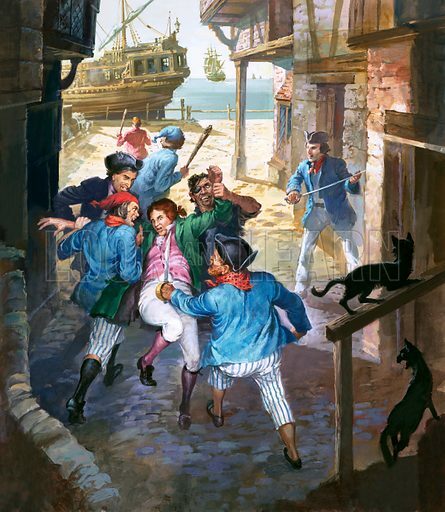 John Taylor fled for his life; but he was not fast enough and soon he was caught and bundled into a ship anchored in the harbour. There was now only one course of action open to him – he had to reveal the secret that he had kept for the past five years. A secret so amazing that there was only one man on board, the ship’s surgeon, to whom he could offer irrefutable proof that his story was true. John confessed to the surgeon that his real name was Mary Anne Talbot – he was really a girl! In 1791, when she was only thirteen, her mother had died and her father, Baron Talbot, put her in the care of Amos Shuker, who lived in Newport, Monmouthshire. Shuker led Mary a hard and miserable life being only interested in the fortune that she was to inherit. 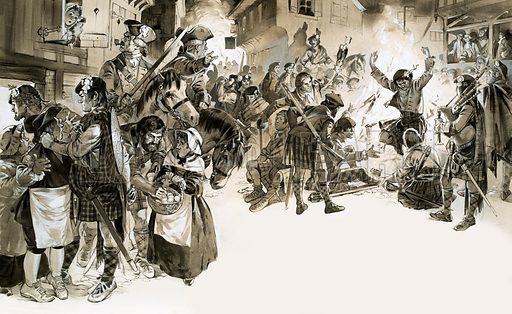 He reasoned that the easiest way to get at the money would be to rid himself of the girl and to do this he enlisted the aid of Captain Essex Bowen of the Prince of Wales Volunteers. 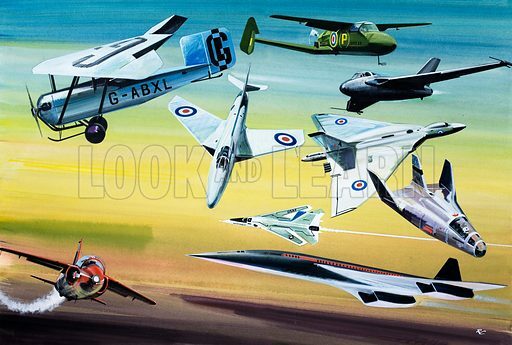 This edited article about aviation originally appeared in Look and Learn issue number 680 published on 25 January 1975. Ever since the Wright brothers conquered gravity with a heavier-than-air machine in 1903, men have been seeking ways of building better and faster aircraft. It is a far cry from the historic, chain-driven plane, in which Orville Wright flew for 12 seconds, more than seventy years ago, to the mighty jets of today. But the intervening years have been marked by many achievements which have brought aircraft to their present peak of perfection. One of the most remarkable of these has been the introduction of swept wings. Early aircraft either had single or double layers of wings (biplanes or monoplanes) and while these created buoyancy they also limited the speed at which the plane could fly. With the development of more powerful engines, the need arose for aircraft to be designed which could remain stable at very high speeds. The swept wing was the answer to this. Sweepback, as the design is termed, minimises the effects of the shock waves that build up when an aircraft reaches the speed of sound. Swept-back wings had been experimented with as far back as 1930, as can be seen from the shape of the Granger Archaeopteryx. During the Second World War, the Miles’ Dragonflies had swept wings or, to be more specific, a swept tail which was called a tandem wing. Since the war, most high speed aircraft have been built with swept-back wings, and greater and greater speeds have been attained. Airliners which fly at over 600 miles an hour and bombers which whine through the heavens at twice the speed of sound are part of today’s aviation scene. 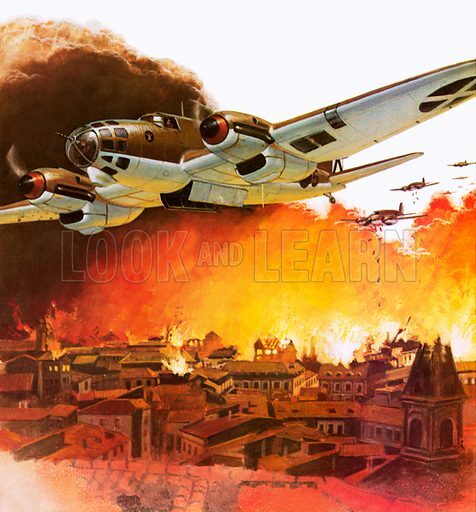 Swept-back wings, allied to the aircraft’s overall design and the power of its engines, have made this achievement possible.